There are 6 papers in the pipeline for this as a PHD project, but this dense paper which has been peer reviewed is the best representation of the work so far. (a) Psychology Cares Scotland, Firdon Crescent , Glasgow G15, Scotland (b) Dept of Clinical Psychology, University of Edinburgh, Scotland (c) Open University, Milton Keynes. You will find my meta analysis of primary cortical content in this paper. i.e. I would like to make it clear, that I can build a case for the dipole model without the distributions extracted here, and that I have always been open minded to complex distributions more common in neurons. i.e there are so many ion layers that the brain works on relative gradients rather than simple positive/negative charges is basic neuroscience. From a developmental view in evolution these bilateral radial glia systems arose from sea environments, where there is an abundance of calcium (radial glia) and sodium chloride. It is interesting GABAA and AMPA receptors (the most plentifiul and ionotropic gate Cl- and Na+ into the postsynaptic membrane with equivalent but opposite voltages gradients. Anybody familiar with the madelung constant for such salt structures will be aware just how equally balanced these ions are, even in solution. We are finding more and more evidence that these ionotropic neurons are resulting in division / multiplication scaling power laws for inhibition and excitation which are more mathematical than hebbian in structure. My idea was that for a dipoles computational function to achieve exponentiation at either pole the very basic lateralized components would require basic mathematical principles to facilitate scaling on top of each other to build coherent convergent/divergent structures that would be useful in a large scale asymmetrical sparse coding computer. Along the lines of HTM, fusters cognits and Hintons Deep belief networks except its key to bear in mind the asymmetry has to over-arch these schemes as this allows the very powerful exponential functions of minimum and maximum descriptions recruited in universal computation theory. 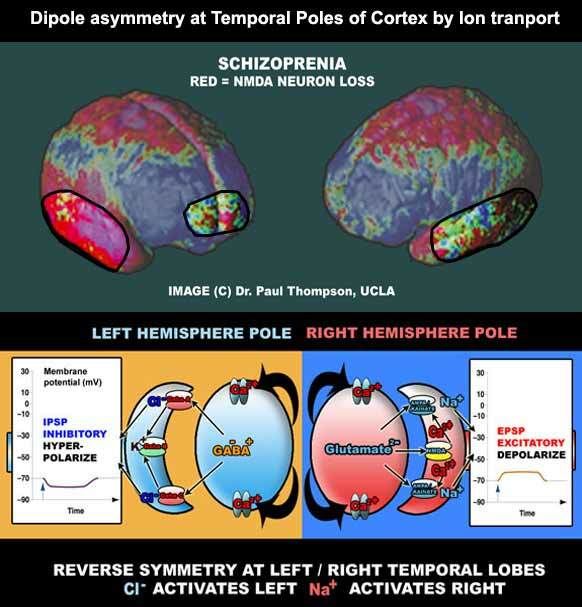 The cortex alone perhaps may be an induction machine which is linearized by the known linearization functions of the limbic system.